Vusi Khumalo was born in Balfour North, Gauteng in 1951. Having completed his basic education in Germiston, he spent 10 years working in various companies in South Africa. In 1986, whilst still working in Germiston, Khumalo felt impelled to leave South Africa, as a long standing member of the African National Congress, and so left with his family for A.N.C. camps in Zambia and Tanzania. It was in Dakawa Camp, Tanzania, where he first had an opportunity to explore fully his life-long hobby, art. Having completed his 0-level General Certificate of Education, through correspondence with the University of London, Khumalo began to be trained and later, to teach textile printing, art and design. This culminated in a summer course in art in the Gerlesberg Art School, Sweden, in 1991. 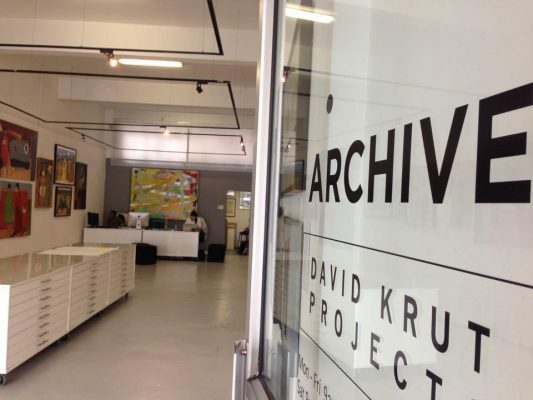 In 1992, Khumalo was repatriated and the Dakawa Art and Craft Community Centre was re-established in Grahamstown, Eastern Cape. He continued to teach there and his efforts won him a one year scholarship to the Konstfack National Art College, Stockholm, where he gained a certificate in textile printing and “art”. In 1996, Dakawa’s funding from Sweden was withdrawn and Khumalo decided the time was ripe for him to dedicate himself full time to his own art. 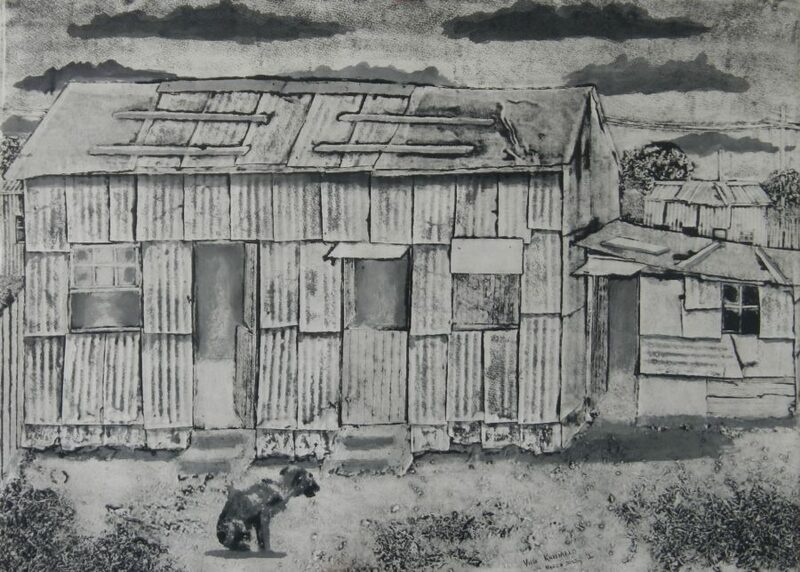 His efforts to render the South African landscape, and particularly the burgeoning squatter communities within that landscape, were frustrated, as he found that oil painting did not bring him the intense realism that he wanted to evoke. This led him to his startlingly real collages. Khumalo, by reconstructing the infamous squatter camps, takes us where we might, otherwise, fear to tread and, perhaps, reminds us that behind the media facade of brutality, crime and squalor, these “growths” on our landscape are populated by human beings under trying circumstances. 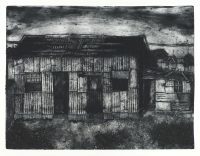 Alongside the collage works Khumalo also produces collographs such as those produced with David Krut Print Workshop in early 2013.